eZeeNow.com :: togglebutton.isChecked() is not working? i have this problem when i try to add my tweet objects to an arraylist in my model, but i'm getting back a NullPointerException. This happens in my SearchTweetsTask class. It only happens when i search for tweets with the twitter api. Getting timelines and stuff works just great, no problems at all. But only when i search for tweets i got this exception. I search for tweets via a searchview in my actionbar which is created in my MainActivity. I hope you can help me. When it returns me a location with a good precision (50 meters or less), I plot it into a map and then I stop the locationmanger updates, rescheduling it to start monitoring updates again 2 minutes later. There are a lot of readings that are perfectly fine, pointing to exact location I am. But sometimes it seems to get 'crazy' and starts to give me wrong locations, but all readings have a good precision (50 meters or less). The strange thing is that my DEVICE IS STILL STANDING sitting on my desktop all the time! I've tested it with 3 different devices (including tablets and phones) and all of them got same behavior in sometime. 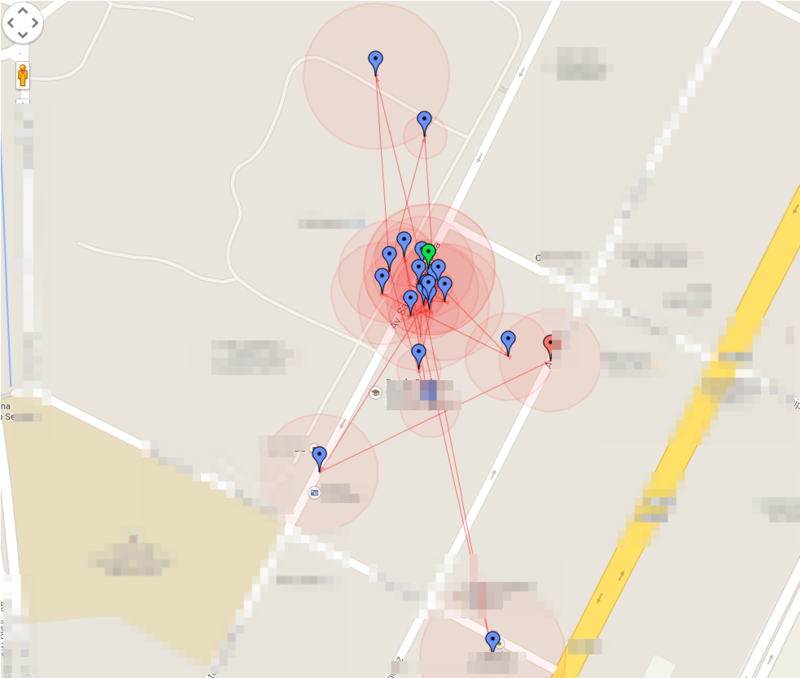 Here's a map showing all locations returned by LocationListener. The green one is the "good one". Red circles show the locations precision (not larger than 50 meters). Does anybody have any ideia why is it happening? Is it possible to POST a comment to existing post via android app using Facebook graph api ? My android app post that includes interactive map and user generated photo. I could not find a way to make both map and photo showed at same post. (Is this possible ? ) What I want to try is to create the post with a interactive map and add a comment with attached photo to achieve previous goal. However is adding comments to existing photo with android app possilble ? If it is could anyone direct me to good examples. ? Thanks ! I am manually adding list items to list view and list item contains one spinner and edit text views. when add new list item to list view all previously entered data refreshing. How can i avoid this issue ? I am working on an Android based GPS Navigation application and it is necessary to implement automatic day and night theme switcher for the application based on the light sensor values. The problem is I have to change the theme without restarting the Activity or the application. I tried to achieve this by following this tutorial (http://sriramramani.wordpress.com/2012/12/06/runtime-theme-change/) where custom states are used to change between day and night mode. But it requires lot of changes as my application has many layouts. Also with this implementation developers have to take care of Day and Night modes for future screens. Is there any simple and effective way to achieve this? According to the instructions that Building a Simple User Interface on the website of Android Developers, I am goint to open the fragment_main.xml file from the res/layout/ directory. But based on the ADT Bundle 20140702, there is only the activity_main.xml in the res/layout. Or fragment_main.xml can be found on the version 20140321. I need to write android code with polymer material design code. Can anyone give me a sample code for polymer material design code for android. I am new in Android. I'm building an app with sliding bar format and a part of sliding bar is one Fragment. I can convert Activity to Fragment but now I'm have a Fragment Activity and I want to convert it to Fragment. Can I do it in Android. Thanks for your help. I am working on implementing subscription using Amazon IAP version 2. I am referring to the sample subscription application provided by them, for implementation. Amazon App tester in my device. placed amazon.sdktester.json file in "mnt/sdcard" directory. Could anyone please explain what exactly is going on her? Why the SKU is invalid? How to call one camera Intent having recording as well as image capture? Start a camera intent where the intent should be able to record or capture image. Question: I have seen that whenever we start a camera as stand alone we get all the camera options like image capture,video recording,etc. So,how may I create single intent having both the functionalities programatically ? Note: I found same question on our forum(Duplicate question) but it was not answered,hence asking it again. Does Parse SDK (1.5.1/Android) include the handling of GCM registration id invalidating? According to the GCM docs, "When an application is updated, it should invalidate its existing registration ID, as it is not guaranteed to work with the new version". Because Parse SDK handles the device registration part of GCM (as answered here), can anyone tell me if the current Parse SDK (1.5.1) also includes the handling of id invalidating or not? The below AlertDialog is not displaying the ICON. I tried the option given in this stackoverflow link. Please let me know why the ICON is not displaying. I have a error when i use the project LiveSDK for Android.Login, upfile, browerfile are normal. But when i download a file, the app has error. I have been doing an android database application project recently.When i tried to execute. I cant find the folder 'databases' in the file explorer of the DDMS. I checked the following path /data/data/packagename/databases,but there i could not find databases folder and my database file. I have attached the code for database helper class please help me if there is any error that is preventing me from creating the database or is it wrong with my eclipse. Because even some of my existing projects also dont show up with the databases folder inside them. "CREATE TABLE IF NOT EXISTS " + DATABASE_TABLE+ "("
+ KEY_TIMESTAMP + " INTEGER ,"
also my MainActivity.java code is here. Here i try to insert the data into database by making use of submit button. When i hit submit button the app does not stay for long time and says unfortunately myapp has stopped.my curious concern has been is my database being created or not? I've changed the "Activity" to "ActionBarActivity". Then change the "gettActionBar ()" to "getSupportActionBar (). Difference between android:id and android:labelFor? While searching I got this and it solve that warning message as well. But did not got difference between both attribute android:id and android:labelFor. Any clarification ! Android: Runtime exec() gives null environment? What this code does is, it tries to read the arp cache to fetch all MAC address with their respective IP addresses. Is it possible to understand notification comes from which client? It works. But when I receive message in second device can I have which device send this notification? I have a method in a .jar that I'd like to call in Unity's Start() for a Unity Android build. What's the easiest way to go about this? Can we hide apps installed on our phone using MDM?